Home Affordability Reaches Record-Levels… Last Quarter. Last quarter, with home prices still relatively low and mortgage rates making new, all-time lows almost weekly, the cost of home ownership was extraordinarily low in New Hampshire and most U.S. markets. According to the National Association of Home Builders’ quarterly Home Opportunity Index, 72.5 percent of all new and existing homes sold between June-September 2010 were affordable to families earning the national median income. This ties the all-time high for home affordability, set in the first quarter of 2009. The data also underscores that, when compared to historical norms, it’s a fantastic time to be a home buyer. Prior to 2009, the Home Opportunity Index rarely topped 65. The index has remained above 70 ever since. All real estate is local, though, and on a city-by-city basis, home affordability varied last quarter. For example, 96% of homes sold in Kokomo, IN are affordable for families earning the area’s median income. This handily beat the average figure and led the nation. Looking at major cities, Indianapolis led the pack. 93% of homes in Indianapolis are affordable to families earning the area’s median income. This ranks #9 nationwide. 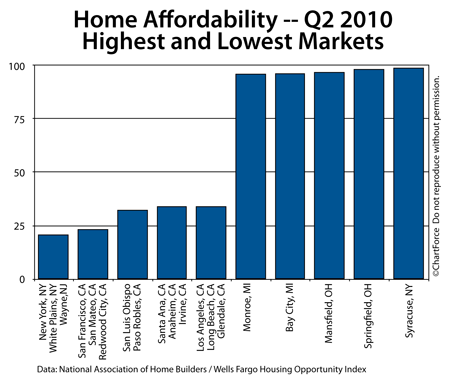 On the opposite end of the affordability scale is the New York-White Plains, NY-Wayne, NJ region. For the 10th consecutive quarter, the New York Metro region ranks last in U.S. home affordability. Just 23% of homes are affordable to families earning the local median income, although this is 3 points higher versus Q1 2010. The rankings for all 225 metro areas are available online. Regardless of where your hometown ranks relative to its neighbors, home affordability remains high as compared to historical values. That said, with mortgage rates rising and home sales expected to climb this winter, it’s unlikely that the Home Opportunity Index will improve. Buying a home may never be this inexpensive again. If you planned to buy in mid-2011, consider moving up your time frame. With home prices holding firm and mortgage rates still dropping, home affordability is reaching new heights. 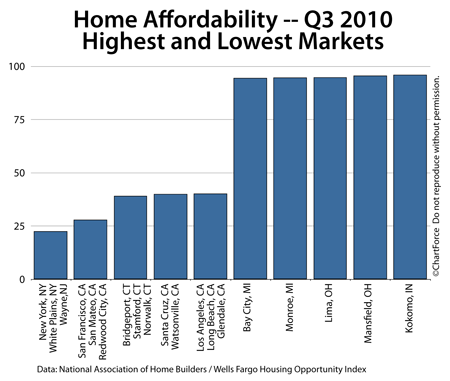 In the Massachusetts and New Hampshire markets, we don’t fall into the most or least affordable range, and I have highlighted our local markets on this chart. As with all aspects of real estate, however, home affordability varies by locale. The rankings for all 225 metro areas are viewable on the NAHB website but regardless of where you live, buying a home is as affordable as it’s ever been in history. Furthermore, because home values are in recovery and mortgage rates may rise, the market is ripe for home buyers.